1. 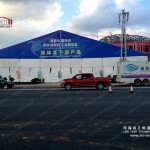 Attached photo shows the big display marquee 40m, It’s original from Liri Tent, which is verified! It can contain about 2000 or more people. 2. 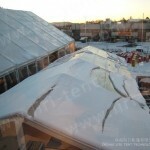 The large display marquee clear-span is 40m. Sizes 40m, 50m, 60m are available The clear span width of our tents is From 3m to 60m and the length is unlimited. We can design most suitable tent to you according to your requirement. 3. The length of the big display marquee could be 40m, 45m, 50m and +5m more. 5.1 Frame uses hard pressed extruded aluminium 6061/T6(13HW). 5.2 The fabric is double PVC-coated polyester textile. It is high quality at waterproof, flame retardant to DIN4102 B1, M2, UV resistant. 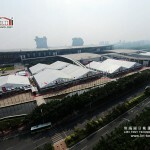 7, The maximum allowed wind speed of the big display marquee 40m is 100KM/h. The security and variability of our products have reached the standard of similar products in Europe. 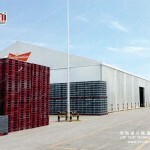 Head office & Factory Add: No.7 Dongfu Street, Xin Qing Science & Technology Industrial Park Doumen, Zhuhai, Guangdong, China. 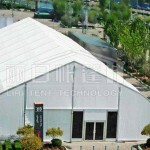 Large Exhibition Tent with elegance outside view.